Cast your mind back to the heady days of the 1980s, an era of bright clothes, dubious haircuts, and even worse synth-driven pop. However, the 1980s also saw the birth of the indestructible compact disc format (ha!) and a subsequent revival in the hi-fi industry. One of the brands that made an impression at the time was Onix, an electronics company from Brighton on England’s South Coast, whose products were distinguished by half width black cases sporting a pair of very large knobs and little else; a bit like a minimalist version of Cyrus amps at the time, and very much like the Cyrus ONE that you’ll find elsewhere in this issue. Together with audio salesman Craig Hill, two Thorn EMI engineers – Adam Worsfold and Tony Brady – started Onix in the early 1980s. While two of the three partners soon left to pursue other interests, Adam stayed true to the cause, and made some well-loved products of the time in the process, such as the OA-21 integrated amplifier with its optional SOAP power supply. A Chinese company decided to promote and use the brand without authorisation for several years, but now Adam Worsfold has revived the Onix name (with the suffix DNA to distinguish it from those Chinese products) in an operation based on the South Coast near Southampton. The first British-built Onix product to see the light of day in many years is the DNA-50 integrated amplifier, an unusually slimline and artfully executed piece of kit. The low profile might suggest a switching power supply, but under the lid is a very slim toroidal transformer that forms the heart of a linear PSU to drive the conventional analogue circuit. The slim, anodised, and well made cabinet is deceptively clever, as it’s not only designed to effectively ‘disappear’, but also acts as a heatsink because the output transistors are connected directly to the case. All that metal means that the DNA-50 runs cool and can be kept in enclosed spaces with no danger of overheating. However as the remote is an infra-red type, it needs to be able to ‘see’ the amp in order to ‘control’ it. 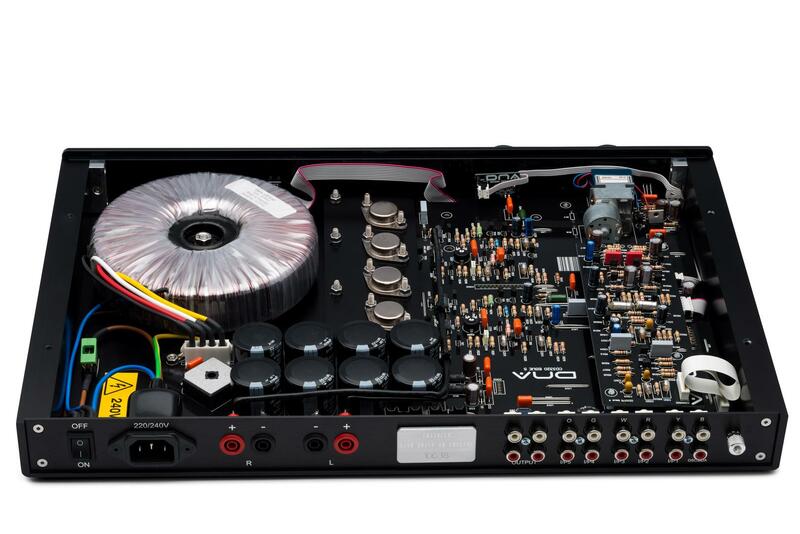 The fascia is one of the most minimalist in the integrated amp business. There is a green light on the volume control and a selection of tiny, coloured LEDs on the other side that indicate input. This assumes, of course, that you can remember which colour relates to which input, but it’s probably as good a system as numbered inputs, and better than arbitrary input names. The sockets on the back have single letter identifiers: ‘G’ for green, ‘O’ for orange, and so on. There are plenty of sockets, too; six pairs of inputs and two sets of outputs. 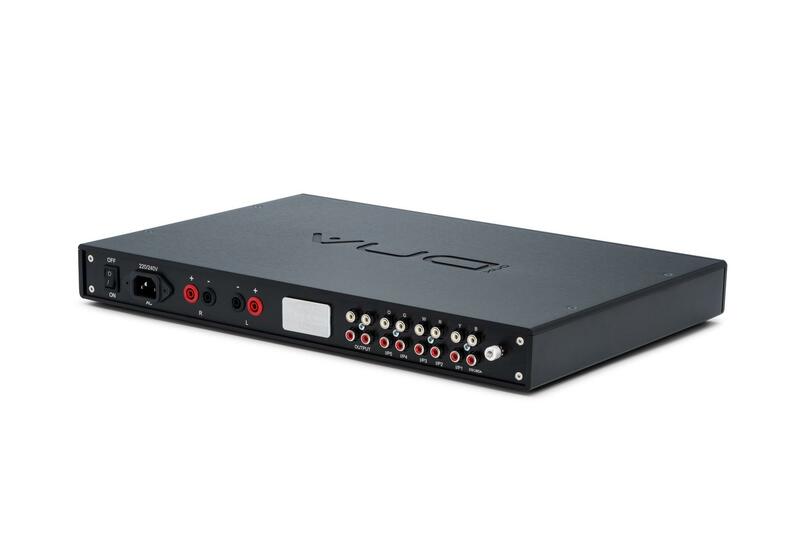 One set of inputs, ‘B’ for blue, connect to a moving magnet phono stage; the option of an MC stage (and, for that matter, an onboard DAC) is in the pipeline. Speakers connect to the relatively uncommon ‘BFA’ type socket that features a unique (and electrically safe) shrouded plug, but can also take a 4mm banana plug. However, this precludes the use of bare wires or spade connectors without some form of adaptor.